Spring is nearly upon us (breaks out into Carlton dance from The Fresh Prince of Belair) ...and that means saying goodbye to the deep and dark winter shades and inject some colour back into your life. Now, it may not be warm enough to dust off the bright t-shirts and hot pants (side note - I don't "do" hot pants) but if you want to sprouse up your look an easy way to do this is with your nail polishes. I've picked a few colours that I think can see you through the spring and hopefully see the return of the sun. 1. Barry M Gelly polish in 'Dragon fruit' is a pretty Barbie pink, not too "in ya face" like some pinks out there, but I think this a really wearable colour if you're not into vivid or pale pastel shades. 2. Nails Inc 'Summer Place' is a pastel banana shade that is actually very wearable. This would also look fabulous in summer sporting a tan as it would complement it perfectly. 3. Models Own 'Apple Pie' is a fresh minty green for those that love really pastel and pale shades. I love this colour but I hate the formula of the polish. It's so streaky and looks best with 3 coats or a white polish underneath as a base coat. Never the less a pretty spring/summer shade to have. 4. Maybelline Color show* 'Cool Blue' is a pastel royal blue, not a colour for everybody but it does give off that fresh spring vibe. I just need to mention the formula is super pigmented and the swatch above is with only one coat! Fab for those (like me) who never really have the time to paint their nails, this is a one coat wonder. 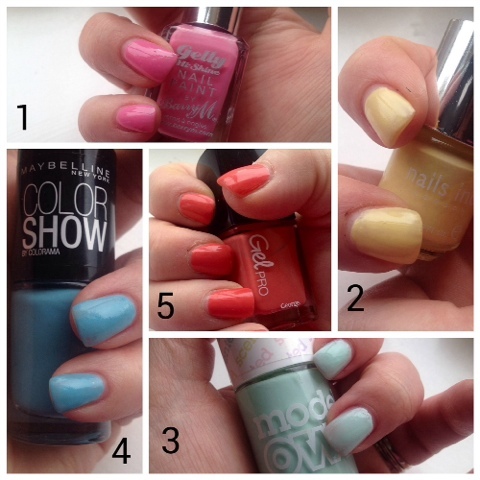 What shades will be covering your nails this spring? In the spring time , I prefer pastel colours. I think it really goes well with the blossoming trees.